A couple of months back, His Lordship and I checked out the newest upscale barbecue joint. I was pleasantly surprised by the vegetarian chili, which was pleasantly spicy and full of chewy seitan pieces and chunks of vegetables in a not-too-thick tomato base. I was equally impressed by their pecan pie, which nimbly sidestepped all the usual dangers of the genre. 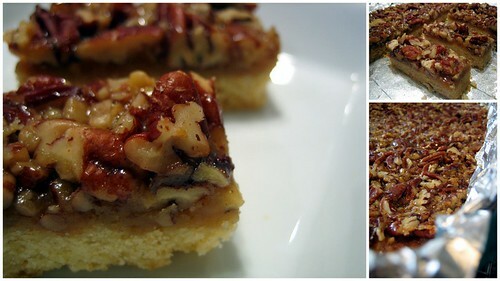 It was sweet but not tooth-destroying, had quite a decently flaky crust, and was bursting with nicely-sized pecan pieces. Good though it was, the pie reminded me of an even-better bar cookie I’d previously made. The cookies poured a decadent honey and brown sugar caramel over a buttery base and covered it with a blanket of chopped toasted nuts, taking all the charms of a really good pecan pie and ramping them up to dazzling. 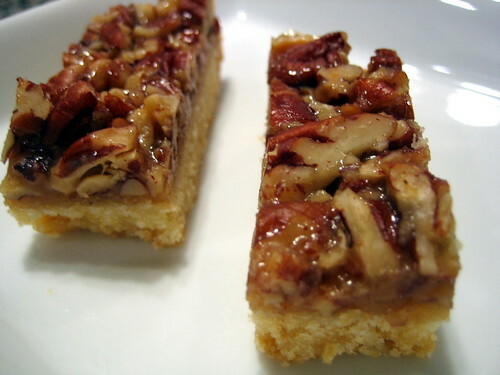 A week or so later, I made the bars again, and was wowed all over again. The price to be paid for this degree of wonderfulness is getting out the dreaded candy thermometer, but I promise it’s absolutely worth it. The bourbon-infused caramel offers all the symphonic roundness the standard one-note corn syrup substrate can’t. Since the cookie base holds up much better than pie crust, I’d even venture to suggest that these bars, cut into more pie-sized slices, would make the perfect make-ahead dessert for Thanksgiving. Preheat the oven to 400 F. Line a 9 x 13 baking pan with nonstick aluminum foil, leaving several inches of overhang all around. In the bowl of a mixer fitted with the paddle attachment, combine the butter, sugar and egg and beat until fluffy, about 2 minutes. Whisk together the dry ingredients and add to the butter mixture, beating just until smooth. Spread the cookie dough in a thin, even layer in the lined pan. Bake on the center oven rack for 12-15 minutes, until golden in the center and a bit darker at the edges. Set on a wire rack while preparing the caramel layer. Lower the oven temperature to 350 F. Spread the pecans on a baking sheet and toast just until they darken slightly and release a nutty aroma. Chop the pecans moderately fine and set aside. Bring the butter, honey, brown sugar, and cream to a boil in a medium saucepan over medium-high heat. Insert a candy thermometer and continue to cook at a low boil until the caramel reaches 250 F. Remove from the heat and stir in the bourbon and half the chopped pecans. Pour the caramel over the crust, spreading all the way to the edges, and sprinkle the remaining cup of pecans over the top. Bake for 15-20 minutes, until bubbling and browned. Cool to room temperature on a wire rack, then refrigerate until well chilled, at least 1 1/2 hours. Use the overhang to lift the cookie slab out of the pan and onto a cutting board. Pull the foil away, then use a sharp knife to cut the slab into narrow bars, cleaning the sticky residue off the blade between cuts for a clean slice. The original recipe was made with hazelnuts, which are wonderful but obviously more work. It also had a chocolate garnish on top, formed by sprinkling the still-warm bars with very finely chopped chocolate and leaving it to melt. Uncharacteristically, I found it to be a wee bit overkill, since the chocolate distracted from the clean flavor of the hazelnuts and definitely would have overwhelmed the pecans, but feel free to add that back in if you disagree. If you don’t have a thermometer, you can test the caramel for doneness by dropping 1/2 a teaspoon of it into a glass of ice water once it thickens and starts to darken. It should form a soft ball in the water which flattens once lifted out. The unsliced slab can supposedly be wrapped tightly and frozen for several weeks, although I have never had the necessary level of willpower to put theory to practice. …to be honest, not everything I had hoped for. I had wanted a clean coconut and caramel flavor, but the brown sugar flavor was a bit overwhelming and it imparted a less than stunning greyish cast to the finished gel. It was still tasty, though, and I still love the idea, so I might try it again soon with white sugar instead. In the meantime, I had two and a half cups of this interesting goo. In trying to find uses for it, it occurred to me that the taste and texture were very much like the filling for German chocolate cake, only more coconutty. A few quick mental hops later, I had pulled together the following recipe by adapting one of my favorite old-fashioned chocolate fudge cake recipes, from Scharffen Berger’s house cookbook, The Essence of Chocolate. I carried the coconut theme even further by substituting coconut milk for the heavy cream in the frosting, which worked seamlessly. Since coconut milk is shelf-stable and always in my cupboard, unlike cream, which I have to make special trips for, I will probably do this all the time in the future. As I discovered when I brought them to work this morning, German chocolate cake has a massive fan base. There are a fair amount of steps involved here, but these were such a huge hit that I will definitely pull out the recipe for special occasions. If you’re so inclined, you can turn this back into a full-sized cake by following the baking instructions for the original recipe. Whisk ingredients together in large heavy pot over medium heat until sugar has dissolved and mixture comes to a boil. Lower heat and simmer vigorously, stirring occasionally, until mixture has thickened to a caramel texture and reduced to approximately 2 1/2 cups, about 30-40 minutes. Transfer to glass jars and cool completely. Cover and refrigerate once cool. In a heavy saucepan, combine the sugar and coconut milk and bring to a boil over medium heat, stirring occasionally. Reduce the heat and simmer for 6 minutes. Remove from heat, add the chocolate and butter and stir until melted. Pour into a bowl and stir in the vanilla. Cool until thickened to a spreadable consistency. Preheat oven to 350 F. Line 3 cupcake tins with paper liners. In the bowl of a stand mixer fitted with the paddle attachment, combine the sugar, flour, cocoa, salt, baking powder, and baking soda on low speed. In a liquid measuring cup, mix together eggs, oil and milk. Add liquid ingredients to mixer and beat on medium speed for 2 minutes. Dissolve espresso powder in boiling water. Reduce mixer to low speed and add water mixture, blending just until a very liquid batter forms. Ladle batter into lined cupcake tins, filling each cup just over half full. Bake for 20 minutes, or until tester inserted into a cupcake comes out clean. Remove from oven and allow to cool completely in tins. While the cupcakes are cooling, spread the pecans and the coconut on separate quarter-sheet pans and toast in the oven for 10-15 minutes, until pecans are fragrant and coconut is pale gold. Stir midway through toasting to prevent the coconut from burning. Set aside to cool while frosting the cupcakes. 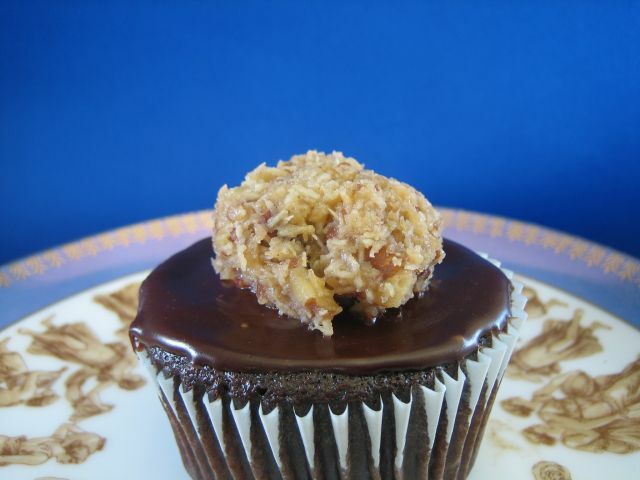 Frost each cupcake with a generous amount of ganache, then set aside briefly to set up while finishing the topping. 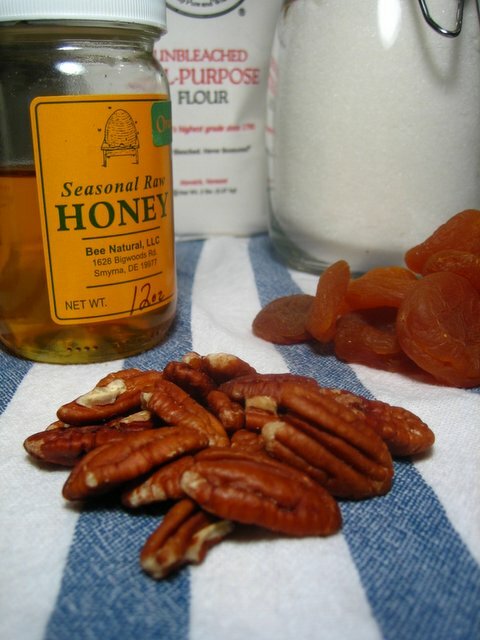 Chop pecans medium-coarsely and mix together with coconut and approximately one cup of the caramel, or just enough to bind the pecans and shredded coconut together. Top each cupcake with a large scoop of the sticky mixture, and serve. For some reason, I always develop a mad desire to bake on Sundays. Maybe it’s a desperate attempt to stave off Monday for a little longer, or perhaps it’s just that Sundays are the only day of the week I really have the leisure to bake, since Saturdays are usually taken up with errands and eating out and movies and the million other things you feel you have to cram into your two days off. By Sunday night, you’ve given up on having the time of your life, and you’re happy to settle for the small and quiet pleasures you can fit into those last few hours. Since even I am not ambitious enough to bake a cake or eclairs at the last minute and for just two people, it’s almost inevitably cookies that I end up making on Sundays. Cookies are fast, easy, and endlessly varied, so I can usually indulge whatever particular craving I have with ingredients I already have on hand. The other nice thing about cookies is that I can bake as many as I think the Lord and I will actually eat, and put the rest of the dough in the freezer for another day. Most of the time, I end up freezing half the batch and taking all but about a half-dozen of the baked cookies to work with me on Monday, which provides the dual benefit of getting all of those calories out of the house and ingratiating me to the coworkers. Tonight, I felt like chocolate, so I flipped through my latest favorite baking book, The Village Baker’s Wife, and found a recipe for Triple Chocolate Chunk Cookies: chocolate cookies with pecans and semisweet and white chocolate chunks. Since I’m not a great fan of white chocolate, I decided to substitute the Guittard butterscotch chips I bought a few weeks ago on a whim, thinking that the chocolate, pecan, and butterscotch combination would be reminiscent of turtle candies. The raw dough was absolutely divine; it tasted like a very thick chocolate cake batter or buttercream frosting. The baked cookies are very fudgy and brownie-like, especially if you underbake them slightly. They’re really, really rich, though, so the three dozen I’ve baked so far will be going to work tomorrow, and the remaining half of the dough will be portioned out with my miniature ice cream/cookie scoop and put into freezer bags for the next time I have last-minute guests or a frantic chocolate craving that the cocoa recipe can’t satisfy. Chop the 7 oz of chocolate with a serrated knife and melt, either in a double boiler or in the microwave. (If the latter, use 20-second increments and stir between blasts to make sure that you don’t burn the chocolate.) Let cool slightly. Cream the butter and sugars together in a mixer until fluffy. Add the eggs one at a time, incorporating the first one thoroughly before adding the second one, then the vanilla and melted chocolate, mixing until blended. Mix the flour, baking powder, baking soda and salt together, and add it to the creamed mixture in two or three batches, being careful not to over-mix. 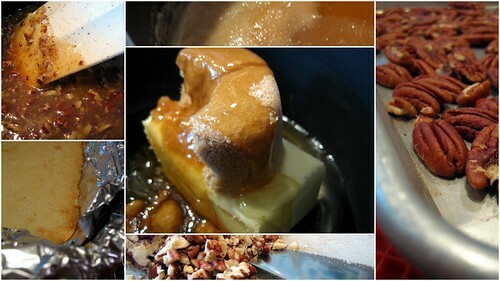 With a spatula or spoon, stir in the chips and pecans. With a spoon or cookie scoop, drop 2 tablespoons of the dough onto parchment-lined baking sheets, leaving two inches between scoops. Bake for 13 minutes. 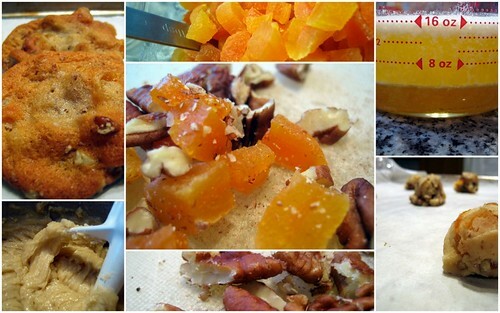 Notes: Next time, I might reduce the quantity of chips and chop the pecans more coarsely. I prefer a cookie with chips in it to a mass of chips and nuts bound by a web of dough, and this recipe is pretty close to my overload point. I bet kids would love the fully-loaded version, though. One advantage to being so chip-heavy is that the dough doesn’t spread very much, so you don’t have to be overly scrupulous about spacing with these cookies. 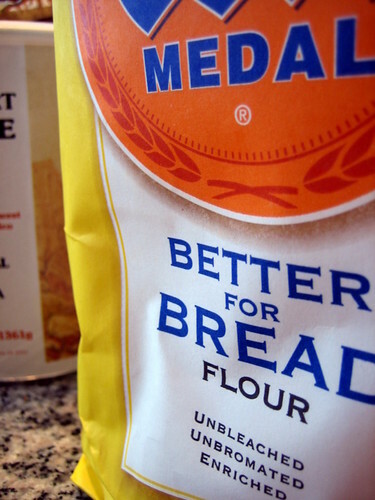 This recipe makes a huge amount of dough. You could probably get away with halving it if you’re not in the mood to feed an army or stockpiling for a cookie emergency. Last weekend’s Sunday cookie was almond macaroons, because I had three egg whites left over from making an egg yolk-based frozen honey mousse (about which I’ll blog separately when I have a moment, as it was an object lesson in Choosing Your Ingredients Carefully ). These cookies, from Nigella Lawson’s How to Eat, come in handy whenever I have egg whites to get rid of immediately but don’t want to bother with meringues, pavlovas, or anything else that will require getting out the Kitchenaid. They’re also great last-minute lazy treats, provided you have ground nuts on hand. Combine the ingredients into a thick paste, and drop with a small cookie scoop or two spoons onto a parchment-lined baking sheet. 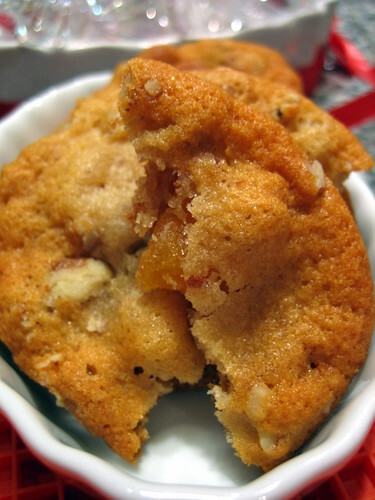 Press a few almond slivers or a whole blanched almond into each cookie, and bake for 20 minutes, or until set on the outside but slightly soft when pressed. Allow to cool on a rack before eating. Notes: Trader Joe’s now carries ground almonds (and, sporadically, ground hazelnuts, which also work beautifully here if you substitute vanilla extract or Frangelico for the almond extract), which makes this recipe practically effortless. If you can’t find pre-ground nuts, you can make your own in a food processor by processing whole nuts with a few tablespoons of sugar, taken from the quantity required in the recipe, until finely ground. The sugar acts as an abrasive and makes sure the nuts maintain a flour-like consistency, preventing them from turning into nut butter. The original recipe used two egg whites. I’ve scaled it up to three, since I had three whites to use up.